Yet the 16 invited participants from five northeast Georgia counties worked hard to make the conversation nonpartisan at least, stating sometimes similar, sometimes different points of view respectfully and without direct references to parties or even to political leaders. 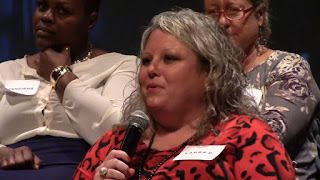 As a consequence, the event–held in Oconee County and sponsored by Conservative Republican Women of Northeast Georgia under the Engaging People In Conversation label–was one that participants said should be repeated in the future. Joan Rhoden introduced the program for what she called E.P.I.C. Northeast Georgia, but the link to and sponsorship of the Conservative Republican Women of Northeast Georgia was prominent in the program. 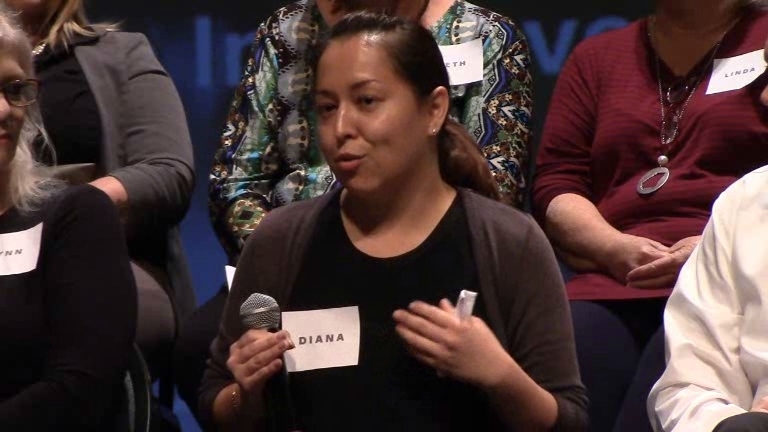 Participants were recruited, nominated and selected based on their experience with the six topics covered at the event held last October at the auditorium of the Oconee County Civic Center on Hog Mountain Road. The group was biased toward small business owners and educators, but it contained differences in terms of ethnicity, race and gender. The moderator was local radio newsman and conservative commentator Tim Bryant from WGAU, who did insert a partisan reference to “Make America Great Again” into the discussion and made a pointedly negative assessment of single-payer healthcare and of others issues during the night. One of those missing was from Walton County, leaving that county unrepresented on the panel. “The E.P.I.C. questions were carefully chosen to prompt candid responses and were specifically designed to steer dialog away from political or ideological rhetoric while offering the kind of prompts that will lead to the stories that will make this evening informative and inspirational,” Rhoden said at the program’s start. About half of the participants owned a business or had in the past, they told Bryant in response to an initial question. Bryant followed by asking those with businesses to identify the greatest challenges they faced, and the discussion immediately turned to regulation. What followered were complaints about Watkinsville, Athens-Clarke County and Winder. Ashley Christiansen from Barrow complained that Athens-Clarke County had permitted chain restaurants that were in close proximity to her pizza restaurant there, putting her out of business. She also complained that the city wouldn’t allow her to put a sign board on the sidewalk in front her store in the public right of way. Joe Riehle complained that code enforcement officers in Winder wouldn’t allow him to put up a banner advertising his butcher shop. Riehle mentioned the Chamber of Commerce and the small business center at the University of Georgia. Another participant mentioned University of Georgia county extension agents. Bryant asked participants if the economy had affected their businesses or families within the last five years. “It just wasn’t happening,” he said, citing the tough economy of a few years ago. Bryant asked the educators “what kinds of changes” they had experienced in their careers, unleashing a long list of complaints about state and federal mandates. Low pay and few pay increases also were mentioned. Belen Epperson, a professor who lives in Oconee County, complained about how technology is being used to teach Spanish, saying students are playing video games rather than learning how to write in the language. What followed were several additional complaints about how students were using technology. Brooks from Clarke County said she has a child in private school and a child in public school and the student to teacher ratio is 12 to 1 in the private school and 30 to 1 in the public school. “The classroom to teacher ratio definitely has a big impact on what’s going on in the classrooms,” she said. Bryant’s question on freedom of speech produced a lively discussion. Everyone who spoke agreed that the country has problems with its healthcare system. “The health care act has helped,” Tashawna Willoughby, a business owner from Madison County said. Without the Affordable Care Act, people who need care are not going to get it, she said. Beth Warner from Madison County said that one of the key problems is that many people make money off health care but don’t provide health services. Epperson said she came to the U.S. legally from Columbia after getting married. “I never thought about coming to America. But here comes a Gringo to Columbia and I fell in love with this Gringo,” she said. Apperson offered a lengthy criticism of people who are in the country and are critical of President Donald Trump, though she did not mention Trump by name. “ I respect the fact that who the American people elect for president, it doesn’t matter if I like him or not, but it is the American people that elected the president,” she said. Immigrants should “respect that,” she added to big applause from the audience. Perez said she entered the U.S. illegally with her parents when she was seven years old but is now a legal resident. She favors continued protection for people who came to the country under similar circumstances, but she, too, was critical of those who have protested against immigration policies. “We like our standard of living,” Laura King from Oconee County said on immigration. “To me its an economic thing. “In what ways have the experiences of other panelists impacted you this evening?” Bryant asked in closing. “And is this the kind of focus group format, is this the kind of tool you can see benefitting our communities at large? “I wish we could have more like it,” Riehle said. “Hearing success stories” is helpful, Brooks said. Bell gave me the video shortly after she recorded it, and I uploaded it at that time, but I did not get a chance to watch it until now. I am posting the video and writing about it now to provide an opportunity for others to hear the conversation. Each of the 16 participants explained why she or he joined the program and gave a brief introduction, starting at 4:17 in the video. The discussion of business begins at 11:40 in the video. The discussion of the economy starts at 25:06. The discussion of education is at 37:15. The discussion of freedom of speech is at 1:00:30. The dialog about healthcare starts at 1:14:30. Closing comments are at 1:46:30. OCO: EPIC 10 24 2017 from Lee Becker on Vimeo. Well done and not particularly partisan after all. Dissatisfaction with government interference with rules and regulations affecting all topics discussed was quite uniform. As administrations continue to strip away politically motivated and onerous regulations allowing businesses to thrive more easily, add in lower taxation, watch job growth and taxable economy spark a growth cycle to finally get out of the doldrums of the worst post-recession GDP growth since the 1940s.